Kimsooja’s video installation Beggar Woman is one of five works on view at the UMass University Museum of Contemporary Art. Filmed in 2001 the eight minute and fifty second loop depicts the artist sitting in the middle of a sunny street in Lagos, Nigeria. We view the artist from the back and slightly above, as if we were standing behind her, her face is completely obscured from us. She sits cross-legged in plain grey clothes, a long dark ponytail running down her back and one open hand slightly outstretched. Her form takes up the majority of the screen and the hustle and bustle of the street is restricted to the edges and corners of the film. We see only the feet and legs of the passers by. It is as if Kimsooja projects a kind of force field that others cannot cross into. Twice single figures pass into the field to interact with the motionless protagonist pressing something, or taking something out of her open hand. These figures are also faceless although we do see arms and part of their torso. The artist does not react to them. She remains perfectly still throughout the entirety of the video. Occasionally the wind rustles her hair or the fabric on her clothing. By not showing her face to the viewer she becomes an anonymous vessel that the viewer can step into. As we stand motionlessly watching the still figure the distance between the viewer and the figure collapses, the artist’s world is our world. It consists only of our own stillness and the motion of the people around the edges of the screen. The figure is unmoved by the action that invades her still world. She is completely isolated from the commotion on the outskirts. She holds her hand out as if asking for alms, but shows no response or gratitude when she receives them, and no objection if they are removed. If it is not alms, what is she begging for? 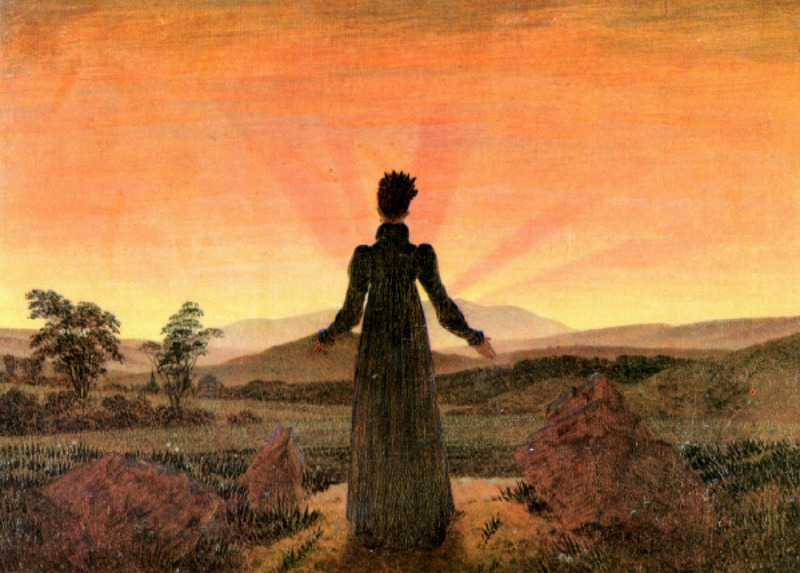 One could look to Caspar David Friedrich’s work Woman in Front of the Setting Sun as a parallel to Kimsooja’s Beggar Woman. It was Friedrich, in fact, who introduced the concept of showing the subject from the back. Since the figure’s own specific identity is ambiguous, there is room for the viewer to relate to the figure. The problem is that the figure also obscures the event the viewer is supposed to experience. As in Friedrich’s Woman in front of the Setting Sun where the woman’s silhouette prevents the viewer from seeing the actual sunset, similarly in Kimsooja’s Beggar Woman, the viewer is never privy to anything going on around the main figure. Both works are also spiritual experiences for the viewer and the artist. In both cases the artists create religious experiences that they invite the viewer to take part in. Both deal with the relative unimportance of man in the face of the greater universe and divine eternity, and both seek spiritual enlightenment. However, the artists differ in how they use the figure’s relationship to the environment to express their ideas. For Friedrich’s work the natural environment his subject inhabits is the source of the spiritual experience. The sublime qualities of nature overwhelm the figure, making her seem insignificant. Although, as I mentioned before, the woman obscures the focal point of the sunset from us, her stance, open arms, expressing her complete enrapture by the sunset, help the viewer understand how to experience the event. We do not need to see what she sees because through her we are able to experience it. Beggar Woman, in contrast, offers a meditative religious experience relying entirely on the still figure’s body whose surroundings are minimized. The effect is accentuated through the video medium, as Kimsooja is able to contrast her still figure with the movement of the people around her. The jumbled swirl of feet and legs surrounding the central figure becomes abstracted, meaningless movement. The artist is the motionless center radiating spiritual energy. She is indifferent to the alms she receives perhaps because she is not looking for any kind of commercial satisfaction but instead the same kind of religious fulfillment that Friedrich’s figure seeks. It is particularly interesting that Kimsooja chooses video, a medium dedicated to motion, to highlight stillness. This effect would never be as profound in a painting where everything is ultimately motionless. It is only through the use of modern technology that Beggar Woman is successful and Kimsooja is able to dispose of the excess surroundings that were necessary to Friedrich.